"The eighth Wonder of the World" - the Amber Chamber or "Room" - is a historically unique and exclusive example of the amber material's use and only in the history in monumental work. As it is known amber is very whimsical and fitchery material, its "smart appearance" is overly dependent on temperature and humidity. At once after installation of this amber miracle in the beginning in the Winter Palace the special inspector was allocated for ministration of the amber office. Three large restorations were carried out not until the 19th century, and there were a great number of light repairs. Amber is the tears of sisters Heliades concerning the death of their brother – Phaethon, the legend of which is known for its allegory of impudence and arrogance. Gods, having taken pity on disconsolate sisters, turned their tears into amber drops. Since the end of the 17th century this "gold" of Baltic was actively used as a precious material, blossoming of Prussian art of this period is also directly connected with it. The amber "center" in Europe was owned by the Electors of Brandenburg. The wife of one of them crowned subsequently as Frederick I Sophie Charlotte is also considered as the "author" of the amber room's idea. At all events, it was in her plans entered to rebuild the residence with amber. Works began, but in 8 years the customer dies, and her spouse intends to increase the project to the whole amber gallery in Oranienburg where at one of the visits ready panels from amber that were seen by Peter the Great. Historians note the admiration of an emperor and his desire to have his similar in St.-Petersburg. Frederic's son, Frederick-Wilhelm famous for his pragmatism did not want to continue useless and expensive projects of parents and decided to use the ready thing in diplomatic purposes. It gives the amber panels for an office to Peter the Great in 1716 in honour of concluding an alliance with Russia. The struck Russian emperor makes a reciprocal gift - the 55th grenadier giants and a hanap from an ivory bone made by Peter go to Prussia. It is not known with certainty what Peter the Great was going to do with this amber miracle, but only under the rule of Elisabeth it was ordered to equip an amber room in the Winter Palace. So in 1746 appeared a room for formal receptions in Winter Palace, and since 1755 it moves to the new Great Palace in Tsarskoe Selo. It is interesting fact that amber panels are transferred from St. Petersburg manually in carefully packed boxes. 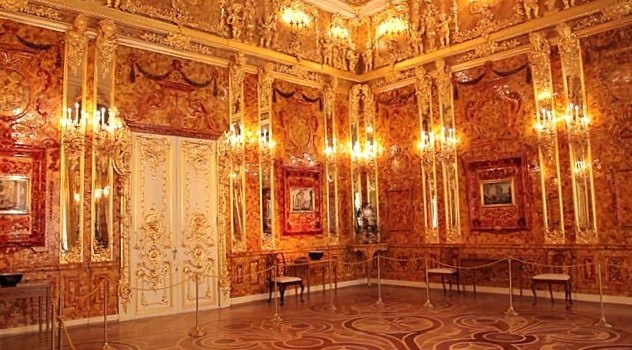 However the hall allocated for the arrangement of the amber room was too large therefore the room was additionally decorated with carving and mirrors, and places of a "shortage" were inhaled with canvas and decorated «like the amber". The amber office takes a final form under the rule of Catherine the Great; on further construction of a room they needed 450kg more amber. As a result three walls of a room are decorated with amber located in three tiers. In the central - there is an allegorical composition in the technology of Florentine mosaics – Taste, Sense of sight, Sense of smell, Hearing and Touch. Such choice of a subject is not accidental at all; amber is eminently suitable for embodiment of sensual allegories. Its "unique abilities" for optical illusions and tricks of the eye are known too. This effect of amber was skillfully used by masters of the rococo interior. In the Amber Room there also were the commodes of Russian masters and China porcelain. In the show-windows there was a collection of amber products, largest in Europe, in a corner there was a little table from amber on a graceful leg. The amber room - is a sight of St. Petersburg. The interior of the amber room is generally reduced to the demonstration of amber, to the material component as there are no especially substantial motives inside it. It is an interesting fact that seven monarchs participated in the arrangement of this European interior's masterpiece though from time immemorial the grandeur and magnificence of imperial chambers was directly connected with gold, and in no way with amber - whimsical, unreliable, time-consuming and "bothersome" material. One more uniqueness of the Amber Room is its enigma. Stealing of a chamber in the years of war, and its last demonstration in 1944 in the castle of Konigsberg and mysterious disappearance after war – all this gave rise to no-nonsense nervousness and search, many years attracted both experts, and the authorities, and also ordinary people to the solution of enigma. 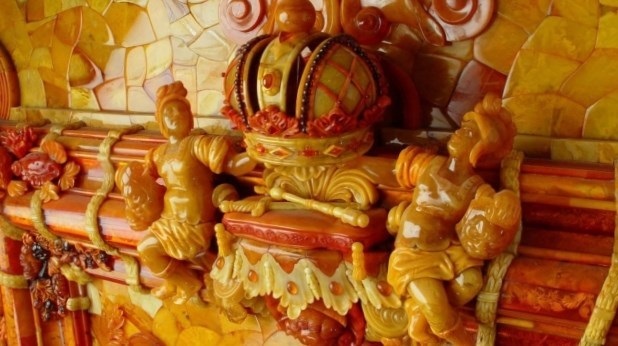 To the 300 anniversary of St.-Petersburg the "reconstructed" Amber Room recreated for 24 years according to drawings and sketches broke upon the whole world, it is located in Catherine the Great's palace (Tsarskoye Selo).